AMD today introduced the ATI FirePro™ 2450, a low profile quad display graphics accelerator that consumes minimal power, delivering exceptional power efficiency. Designed to operate at less than 18 watts, the new graphics accelerator is another example of AMD’s leadership in energy efficiency. The low profile design of the ATI FirePro 2450 enables IT departments to standardize on one card that can be installed in a broad range of systems, including workstations, desktop PCs and docking stations featuring AMD or other processors. With 512 MB of on-board graphics memory the card delivers high performance while streaming media and running applications in several windows and includes full Microsoft Windows Vista® Aero support, all while consuming less than 18W of power on average—making the card an exceptional energy efficient solution for virtually any multi-view environment. 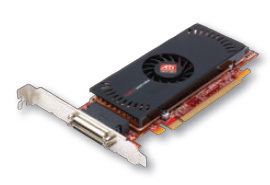 In addition, the ATI FirePro 2450 supports PCI Express 2.0 and offers two VHDCI connectors with breakout cables for quad DVI-I or VGA support. It allows for flexible output configurations, making the card capable of driving multiple high resolution monitors for the maximum amount of screen space. The ATI FirePro 2450 is the latest addition to the ATI FirePro multiview offering, replacing the ATI FireMV™ workstation cards used today by many leading financial services organizations. The new ATI FirePro 2450 graphics accelerator is now available with a MSRP of USD$499. ATI FirePro™ graphics accelerators are available from system integrators and channel partners worldwide. For more information about the new ATI FirePro cards please visit http://ati.amd.com/products/workstation.html.